We were very impressed with Trade Scanners website and products. We decided on the shredder we liked and Trade Scanners were very helpful online and on the telephone. Great service. We are really pleased with the shredder. The only criticism is with the collection box. It is so flimsy, we replaced it with a plastic box, took a while to find one that would fit. Very annoying shredder - the shreddings pile up in the centre of the bag and registers as full giving the need to settle the contents regularily. We purchased, the Rexel RDXI 850.The members of our staff have been complementary in its design size and operational features. We would buy Rexel again and use tradeshredders.com again. This Shedder is fantastic. It has revolutionised our shredding and we have a lot! The bag that catches the shredding could be slightly more robust but we manage. Poorly designed waste collection that piles up in the centre and registers as bag full when only about a quarter full. Need to pull the bag frame out and settle the contents several times until actually full. Jam Free, Hassle Free, Mess Free! Designed for a shared office of up to 20 users, this departmental Mercury shredder provides sufficient security to shred confidential documents into approx. 200 4x45mm cross cut pieces. It features Jam-Free technology with continuous sensing, takes up to 18 sheets at a time and fits up to 450 shredded sheets in recyclable bags enclosed in a pull-out frame for easy emptying. Cross cut P-3 security level. 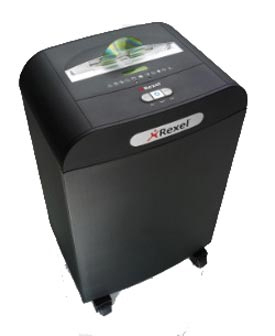 The Rexel RSX1850 provides cross (confetti) cut security for a good security levels. Each sheet is cut into 200 pieces, meaning customers can protect their sensitive information easily and without jams. Shredding up to 19 sheets (70gsm) or 18 sheets (80 gsm) in one pass, the Rexel RDX1850 is perfect for the shredding needs of any office users with a requirement for robust security. The RDX1850 will quickly shred every A4 sheet of paper into 200 cross-cut pieces to ensure that your physical confidential information is totally secure. A large 50L bin holds up to 450 sheets of micro cut paper, ensuring that worrying about empying the shredder will be a thing of the past. With the ability to securely shred CDs and credit cards, the Rexel RDX1850 can handle all aspects of your data security. The shredder is also able to take paperclips and staples in its stride, meaning that customers needn't lose any time in destroying their confidential information.